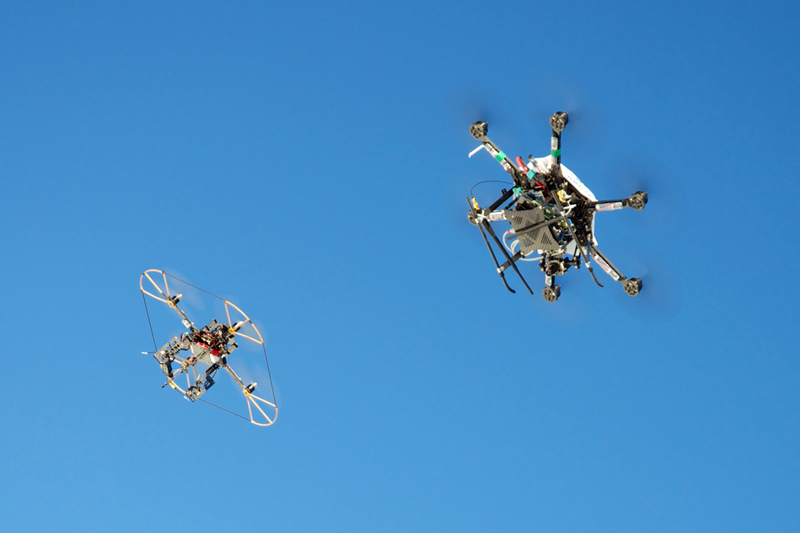 “Our crazyswarm is the largest indoor drone swarm that I’m aware of,” Nora Ayanian states. The assistant professor from the Viterbi School of Engineering at the University of Southern California (USC) in Los Angeles was recently described by MIT Technology Review to be one of “35 innovators under 35.” She came to Klagenfurt to expound her latest results on multirobot coordination. She advocates for taking the perspective of a robot when designing coordination algorithms. Her team thus programmed a multiplayer computer game in which people have to form a certain spatial pattern by moving around, but they are constrained by the limited view of a robot and are not allowed to use any explicit communication. She expects new insights from this game for the development of a human-inspired approach for robot coordination. The second keynote was given by Gianni Di Caro from Carnegie Mellon University. His talk emphasized latest advances in wearable interfaces for multi-modal interaction between humans and robot swarms. His philosophy is that most computations, such as decoding and fusion of vocal and gestural commands, are not done in the robots but in the wearable devices. Gianni was also a guest in Klagenfurt in 2013. “I enjoyed the Lakeside Research Days so much, that’s why I came back,” he says. Two additional highlights were the presentations by Johannes Gerstmayr, professor for machine elements and design at the University of Innsbruck, and Thomas Schmickl, a professor for biology at the University of Graz. Gerstmayr introduced his adaptive tetrahedal elements, which can be put together to form reconfigurable robots and programmable matter. It is fascinating to imagine that these elements have the potential to enable reconfigurable furniture and art objects. Schmickl explained that entities in biological swarms might not need any explicit communication in order to collaborate. He also explained that the behavior of honeybees is quite diverse, and that only seven percent of honeybees are “goal finders” having the capability to systematically find a certain target, such as heat spots. According to Schmickl, the most promising application of swarm robotics is the search for extraterrestrial life forms. He currently develops swarms of small underwater robots for this purpose, which will soon be tested in the Adriatic Sea. About 30 people attended the 2017 Lakeside Research Days, which was held in collaboration with the University of Klagenfurt from July 10 – 12, 2017. Emphasis was on scientific interaction and group work. The participants discussed, for example, the differences between swarms and controlled systems and concluded that swarms are especially useful in unknown and changing environments. The program also included laboratory sessions with training on micro-robots and talks from the Horizon 2020 project CPSwarm. Keynotes were sponsored by the Lakeside Science & Technology Park GmbH, Infineon Technologies Austria AG, KELAG, and the TeWi-Förderverein. Melanie Schranz, senior researcher at Lakeside Labs and one of the organizers, is very satisfied with the outcome of the workshop: “I gained a lot of inspiration from great people for my own research,” she concludes. Further impressions about the event can be found at Twitter Moments and #resdays17.